Citation Information: J Clin Invest. 2014;124(2):742-754. https://doi.org/10.1172/JCI70198. High levels of mammalian target of rapamycin complex 1 (mTORC1) activity in malignant gliomas promote tumor progression, suggesting that targeting mTORC1 has potential as a therapeutic strategy. Remarkably, clinical trials in patients with glioma revealed that rapamycin analogs (rapalogs) have limited efficacy, indicating activation of resistance mechanisms. Targeted depletion of MAPK-interacting Ser/Thr kinase 1 (MNK1) sensitizes glioma cells to the mTORC1 inhibitor rapamycin through an indistinct mechanism. Here, we analyzed how MNK1 and mTORC1 signaling pathways regulate the assembly of translation initiation complexes, using the cap analog m7GTP to enrich for initiation complexes in glioma cells followed by mass spectrometry–based quantitative proteomics. 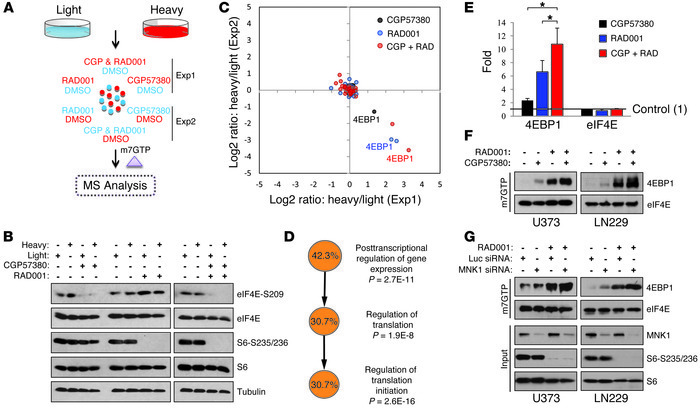 Association of eukaryotic translation initiation factor 4E (eIF4E) with eIF4E-binding protein 1 (4EBP1) was regulated by the mTORC1 pathway, whereas pharmacological blocking of MNK activity by CGP57380 or MNK1 knockdown, along with mTORC1 inhibition by RAD001, increased 4EBP1 binding to eIF4E. Furthermore, combined MNK1 and mTORC1 inhibition profoundly inhibited 4EBP1 phosphorylation at Ser65, protein synthesis and proliferation in glioma cells, and reduced tumor growth in an orthotopic glioblastoma (GBM) mouse model. Immunohistochemical analysis of GBM samples revealed increased 4EBP1 phosphorylation. Taken together, our data indicate that rapalog-activated MNK1 signaling promotes glioma growth through regulation of 4EBP1 and indicate a molecular cross-talk between the mTORC1 and MNK1 pathways that has potential to be exploited therapeutically. Targeting MNK1 increases 4EBP1 association with eIF4E in RAD001-treated glioma cells. (A) Experimental design — isotopically labeled (heavy, Exp1) or unlabeled (light, Exp2) U373 cells were treated with 10 μM CGP5730 and/or 10 nM RAD001 for 20 hours, and protein lysates were combined with lysates from DMSO-treated control cells as indicated and subjected to m7GTP-mediated precipitation of translation initiation complexes, followed by mass spectrometry (MS). (B) Phosphorylation of eIF4E and S6 ribosomal protein was monitored by immunoblotting using phospho-specific antibody. Blots were stripped and reprobed with eIF4E, S6, and tubulin to check for equal loading. (C) Protein abundance changes and (D) gene ontology analysis of precipitated protein complexes identified by mass spectrometry analysis. (E) Fold change of m7GTP-precipitated 4EBP1 and eIF4E proteins from inhibitor-treated cells compared with control cells incubated with DMSO. Data represent mean ± SD. *P < 0.05. (F) Western blot analysis of m7GTP precipitates from CGP5730- and/or RAD001-treated U373 and LN229 cells using 4EBP1- and eIF4E-specific antibodies. (G) Western blot analysis for 4EBP1 and eIF4E (as described above) of m7GTP precipitates from U373 and LN229 cells that were treated for 20 hours with 10 nM RAD001 24 hours after transfection with duplex siRNA oligonucleotides against MNK1 or control duplex against luciferase. MNK1 knockdown and the inhibition of S6 phosphorylation was confirmed using MNK1-, S6-, and phospho-S6-specific antibodies on whole protein lysates (input).